Boys Do Cry: When we expand violence data beyond hate crimes, it's clear that trans men are targeted at comparable rates to trans women. 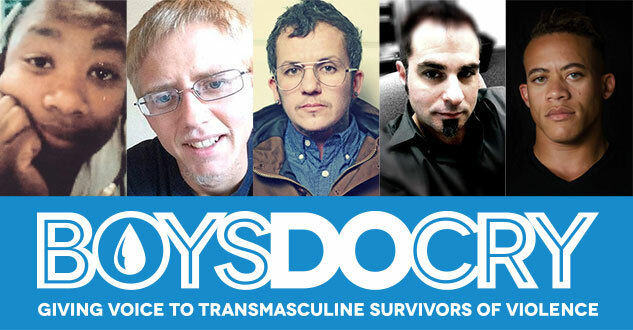 Violence against transmasculine folks is an issue that is currently very much underdiscussed. Part of this invisibility problem stems from the current focus on just one aspect of violence against trans people: hate violence that results in death. But there are other kinds of violence we need to be taking into account to get a full picture, including sexual assault, domestic violelnce, and stalking. The sources of statistics on anti-trans violence mostly come from the Transgender Day of Remembrance list and the National Coalition of Anti-Violence Programs’s annual hate violence reports, which for the past few years have been able to report on the presumed gender identity, sexual orientation, and race of the victims who come to their attention. It is important to note that both of these compilations rely almost exclusively on what is reported by the media — in other words, what mainstream reporters hear about and think is worthy of an article or broadcast. And data does, indeed, show that trans women of color are far more at risk of being murdered than other trans or LGB people. However, what is far less discussed by the media or within the trans/LGB community is that other types of violence — the kinds of violence that affect thousands more trans people than do hate crimes resulting in murder — actually happen at least as often to transmasculine individuals as transfeminine individuals. FORGE, the nonprofit I direct policy and programs for, conducted a national study in 2011 that was approved by the Morehouse College School of Medicine Institutional Review Board and funded by the Office for Victims of Crime. Our survery was answered by 1,005 trans people. 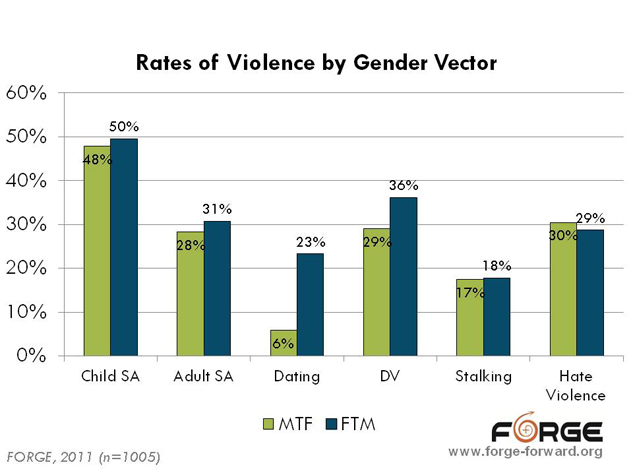 That study shows that transmasculine individuals were actually more likely to be victims of childhood sexual assault, adult sexual assault, dating violence, domestic violence, and stalking than were transfeminine individuals (as shown in the chart below). The only category in which trans women were more likely to be victimized was by hate violence, and even there the difference was small: 30 percent of trans women reported having experienced hate violence, compared to 29 percent of trans men. Sources of data that break out violence by gender identity are currently scarce. The National Coalition of Anti-Violence Programs does not report by gender vector in either of its annual reports on intimate partner violence and hate crimes, and the National Center for Transgender Equality and National LGBTQ Task Force’s 2011 study Injustice at Every Turn typically asked respondents only about violence they felt was caused by their gender identity or expression, which means that much of the violence people experience routinely in their everyday lives may not have been reported on that survey. What Injustice at Every Turn did document is what several authors in The Advocate's "Boys Do Cry" series have written about: that experiencing violence can lead to suicide and suicide attempts. While the overall attempted suicide rate for all the Injustice at Every Turn respondents was the commonly reported figure of 41 percent, for those who had experienced physical assault it rose to 61 percent. Sexual assault survivors had a 64 percent attempt rate and 65 percent of those who experienced domestic violence had attempted suicide. These figures make it clear that sexual assault and domestic violence can be as potentially fatal as hate crimes. We need to pay attention to ending all forms of violence — acts that end in death by self or others as well as violence in the form of nonfatal physical, sexual, or emotional harm. We also must help survivors be heard and helped, since survivors who are not heard and validated have increased risks of mental health challenges, substance use, suicidal thoughts and attempts, and other physical health risks. Speaking of help, even more of it is available than was mentioned so far in the Boys Do Cry series. Domestic violence and sexual assault programs that are funded by the Violence Against Women Act can no longer discriminate against survivors who are male, transgender, and/or LGB. If you experience such provider discrimination, file a complaint so it can be fixed! In addition, FORGE has developed many training webinars and technical assistance publications that can help providers better serve transgender survivors, all available free at our website. Three publications that are especially relevant for intimate partner violence include: Trans-Specific Power and Control Tactics, Safety Planning: A Guide for Transgender and Gender Non-Conforming Individuals Who Are Experiencing Intimate Partner Violence, and Let’s Talk About It: A Transgender Survivor’s Guide to Accessing Therapy. We also have a number of self-help publications online and in the pipeline for survivors or people who may be in abusive relationships. If you are an LGBT person who is or you believe may be experiencing intimate partner violence, you can reach the GLBTQ Domestic Violence Project at (800) 832-1901. The National Domestic Violence Hotline can also be reached all day at (800) 799-7233. If you are a trans or gender-nonconforming person (or partner of such), you can call (414) 559-2123 for FORGE to help direct you to local resources. To file a complaint of discrimination against a domestic violence or sexual assault program, go to the Office of Justice Programs' website. LOREE COOK-DANIELS is the Policy and Program Director for FORGE. Cook-Daniels has been part of the trans community since 1994, specializing in issues related to aging and violence. FORGE is a national training and technical assistance provider funded through the Department of Justice's Office on Violence Against Women. FORGE also supports trans survivors and loved ones who have been impacted by sexual assault, domestic violence, dating violence, and stalking.